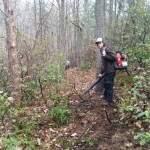 A core focus of CAMBC is to provide education to volunteers and other trail stewards in order to promote sustainable multi-use trail building principles. 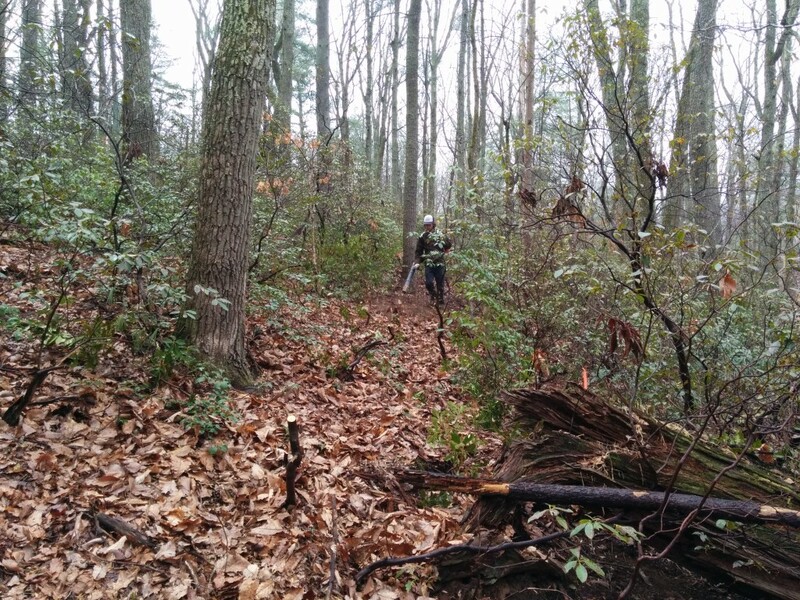 On March 25th and 26th, we hosted a two-day, hands-on training event for our partners in Albemarle County Parks and Recreation, the City of Charlottesville, and the Miller School. 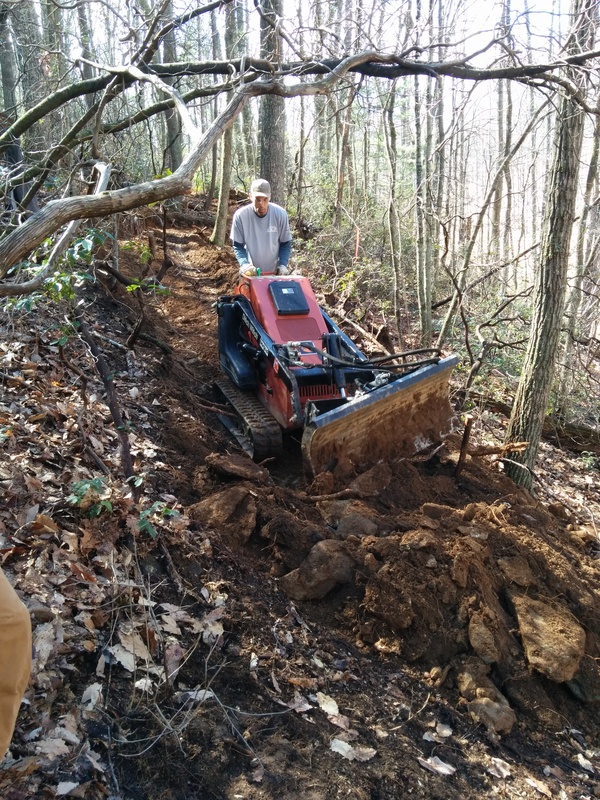 Albemarle County and the Miller School both recently purchased narrow gauge equipment specifically to help build and maintain area trails. 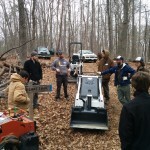 In January, we invited the trail crews from Albemarle County and the City of Charlottesville to join us in a trip to Richmond, where Nathan Burrell of Richmond City parks showed the teams around Bell Isle, a machine-built cross-country trail. 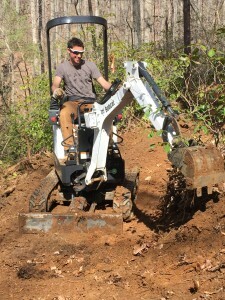 Nathan described trail building as a three-dimensional planning process, illustrated by Bell Isle’s undulating flow, and noted the Richmond pump track as another possibility machines open to trailbuilders. 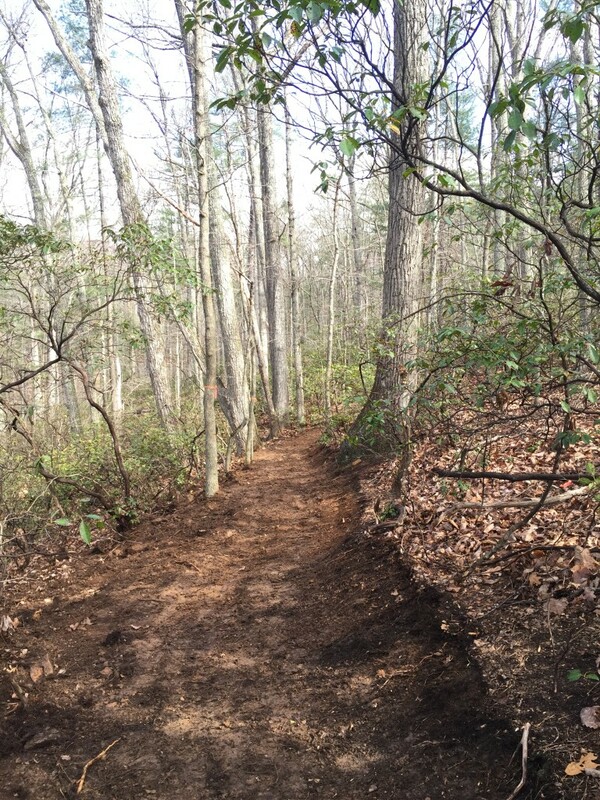 The visit provided some fresh ideas and reinforced the value of a close partnership between municipal teams and local trail use volunteers, who in Richmond dedicate thousands of hours per year toward building trails. 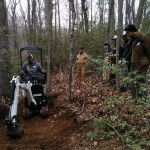 Richmond City Parks and residents have come to rely on one another to create trails everyone wants to use. 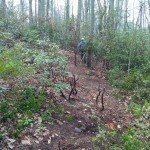 On March 25th and 26th, CAMBC invited Professional Trail Builder Association (PTBA) member Brock Lowery of Ironwood Outdoors to come share his extensive experience in trail design and construction. 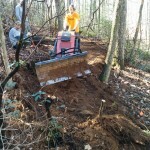 He was joined by colleague Geoff Allen of Bergrad Trails, and a pair of Ditch Witch machines. 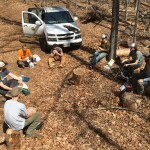 Crews from Charlottesville City and Albemarle County parks departments, led by Chris Gensic and Tucker Rollins, met up at the Ragged Mountain Reservoir trails. 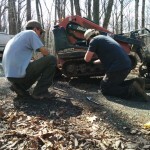 Andy Guptill brought along the Miller School’s Mini-Excavator, and Tucker brought the county’s Ditch Witch. 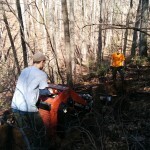 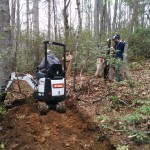 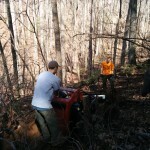 Brock and Geoff demonstrated taking small layers off the trail in multiple passes using a Ditch Witch. 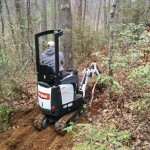 This minimizes damage to the machine, keeping it from spinning its tracks and widening the trail excessively. 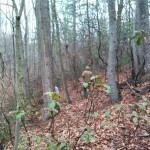 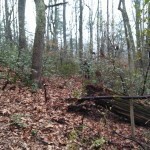 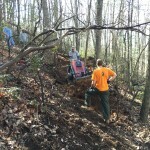 On many sections, the trail is initially sloped inwards, and left with a large berm on the outside. 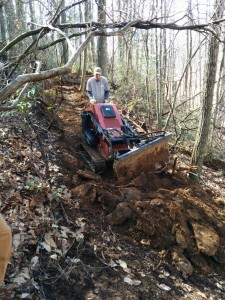 This is important on very steep slopes, they said, because the insloping leans the machine toward the hill in case of a rollover, and the large berm on the outside acts as a “rumble strip” warning the operator they may be backing too far over the edge. 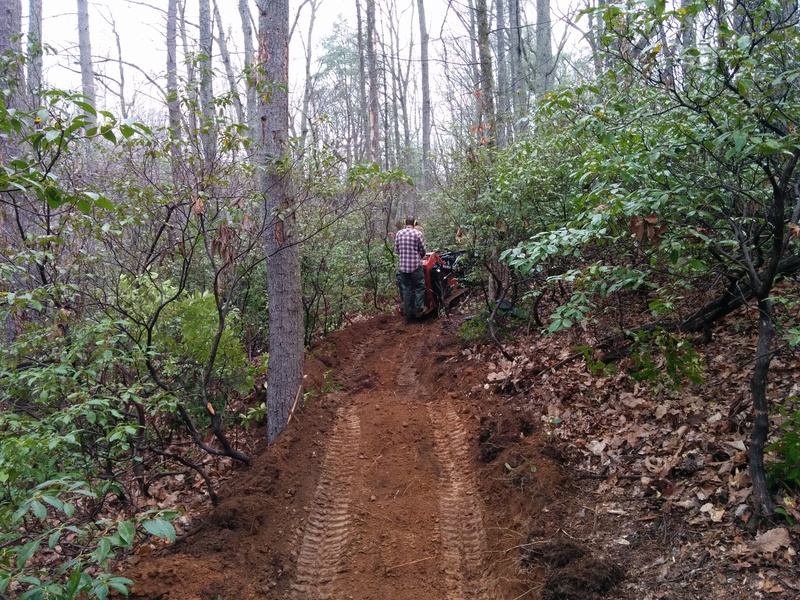 On subsequent passes, the berm grows, but the trail surface flattens and begins to develop a proper outslope. 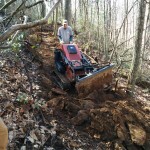 The machine moves on leaving a heavy berm, and a sharp cut in the hillside. 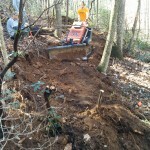 After the Ditch Witch has moved on, the mini excavator or workers with hand tools then knock down the remaining berm and topslope to give the trail a finished look, and allow water to sheet off properly. 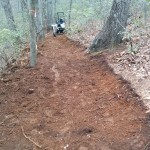 Completed 4 foot wide corridor with a grade reversal, ready for finishing with hand tools. 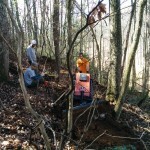 Proper grading of the slope was discussed throughout both days, with methods like grade reversals or undulating the trail to control how and where water flows downhill, and to protect trees. 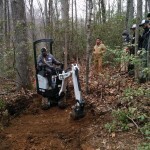 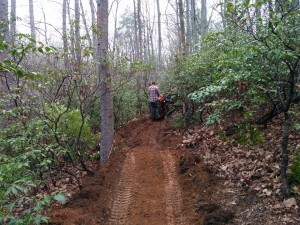 Additionally, Brock and Geoff taught techniques for operating the Ditch Witch safely on steep terrain, as well as how to perform maintenance and repairs on the trail using hand tools. 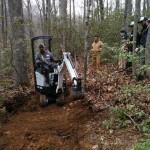 About a quarter-mile of trail was built over two days, with everyone getting a turn training at the controls of the equipment. 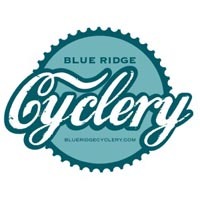 CAMBC is extremely pleased to have facilitated this event, and look forward to opportunities to work with the city and county putting this training into practice. 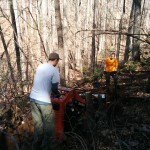 Thanks to all CAMBC members and volunteers. 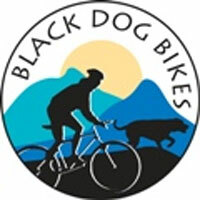 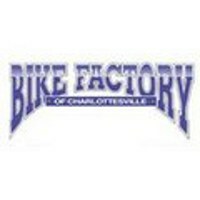 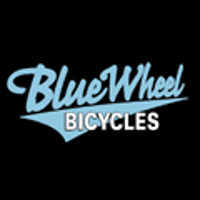 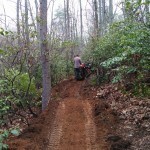 This is how we put your membership dues, volunteer fund raising efforts, and donations back into the trails. 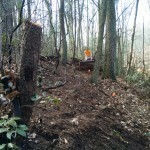 Please join us on trailwork days. 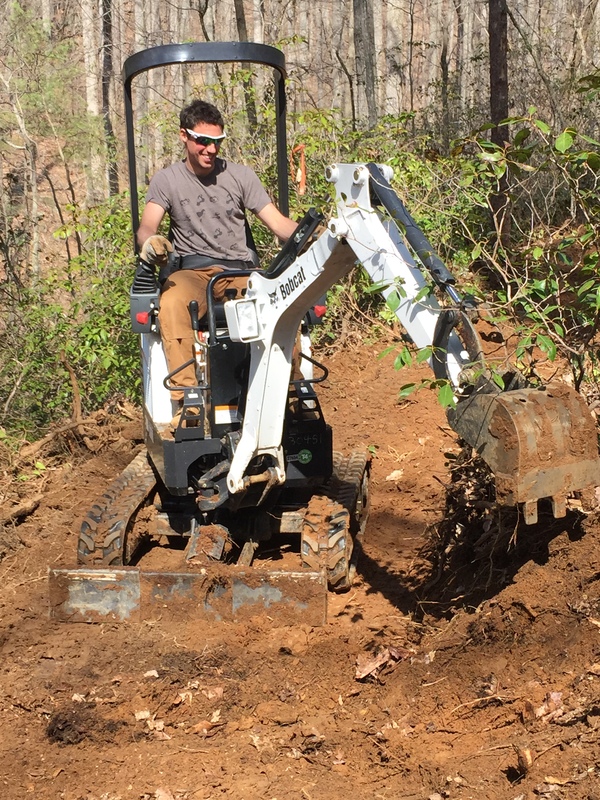 There is always something new to learn when you play in the dirt. 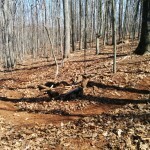 Lunch break. 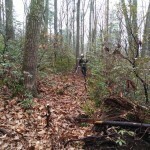 Discussing trail design philosophies.